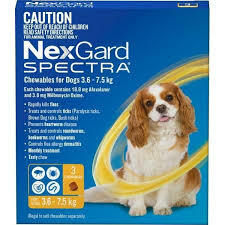 NEXGARD SPECTRA® is a tasty beef-flavoured chew. 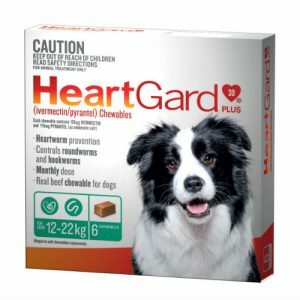 Just one chew, once a month protects against fleas, ticks, heartworm and worms! Nexgard Spectra is a revolutionary new parasite prevention product which protects your dog from fleas, ticks, intestinal worms, and heartworms for a full month. Nexgard Spectra combines two active ingredients to provide complete protection against the most common internal and external parasites of dogs in Australia. 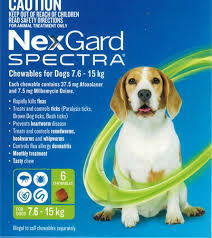 Like Nexgard, Nexgard Spectra protects against fleas and ticks, but has the added benefit of protecting against roundworms, hookworms, whipworm, heartworm and the flea tapeworm. 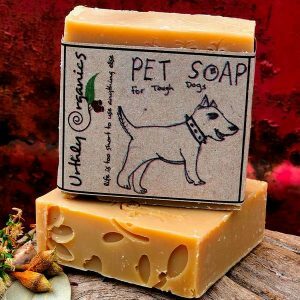 * Kills fleas fast, within 6 to 8 hours. 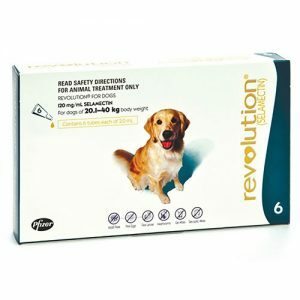 * Rapid action kills newly acquired fleas before they can lay eggs. * Available in handy 3-month and 6-month protection packs. 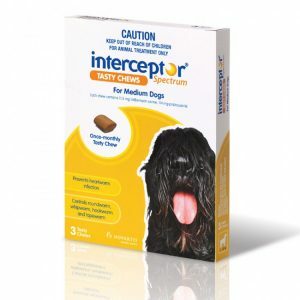 * Treats and controls demodectic mange, sarcoptic mange and ear mite infestations. * Oral treatment, not affected by bathing or swimming. Forget sprays, tick collars, or separate monthly or 3-monthly tablets for parasite protection. 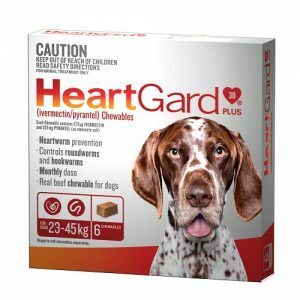 Just one chew, once a month protects against fleas, ticks, heartworm and worms! Give with or without food, whichever is most convenient. Unlike some sprays, spot-on formulations or collars, NEXGARD SPECTRA is not affected by bathing or swimming. Available in handy 3-month and 6-month protection packs.